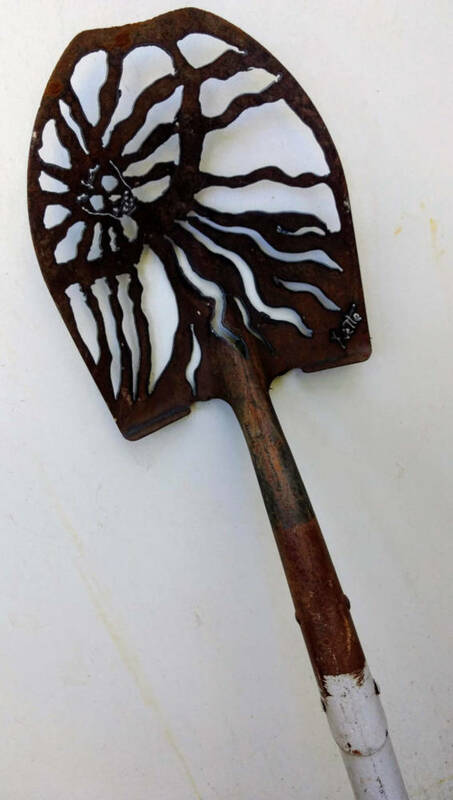 Banshee design hand-cut into a shovel with a plasma cutter. 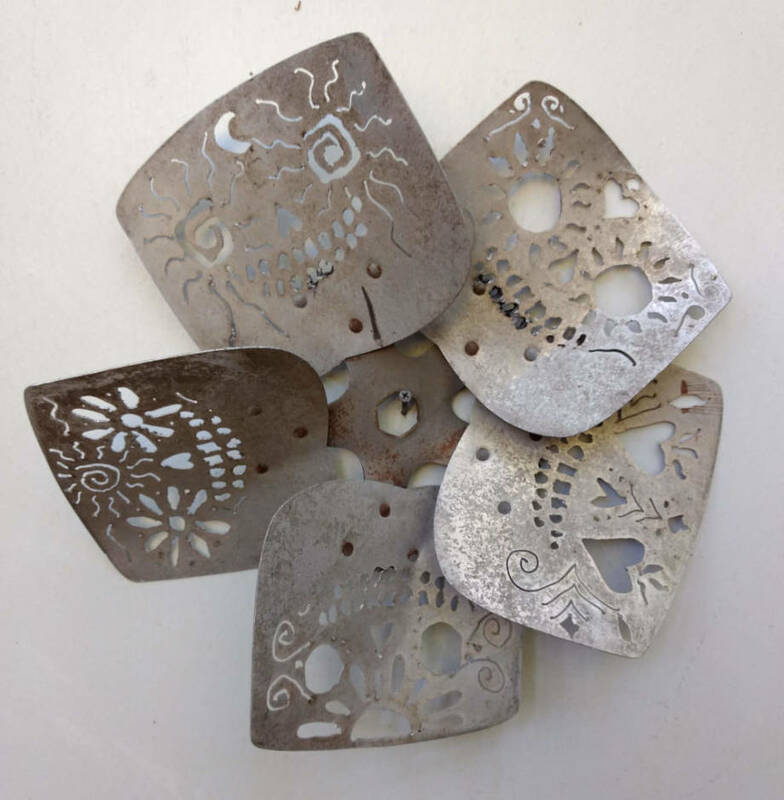 Five sugar skull designs hand-cut into an aluminum fan. Measures 16" diameter. 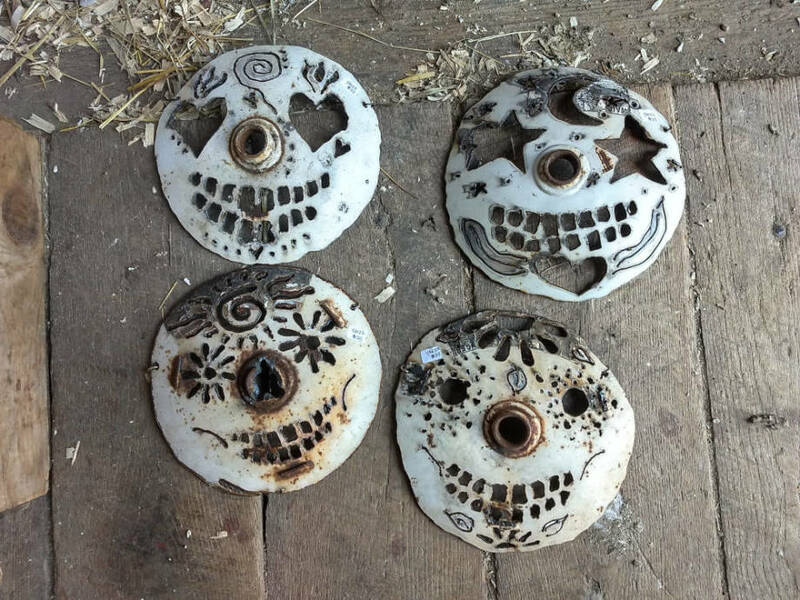 Sugar skull designs hand-cut into the tops of propane tanks, with wire on back to hang. Hang them outside on a tree, fence, shed, or house. Measure approx. 12" diameter. Normally $125, Holiday special price on fire bowls. 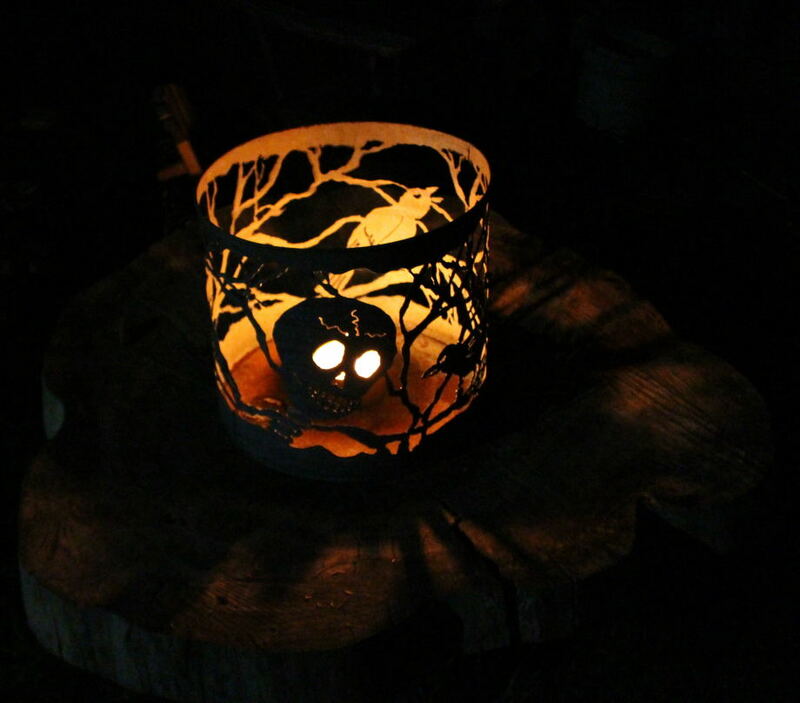 Hand-cut designs in retired propane tanks, heavy enough for small wood fires, and recommended to be used as lanterns. Comes with one outdoor candle with large wick. Skull designs vary. 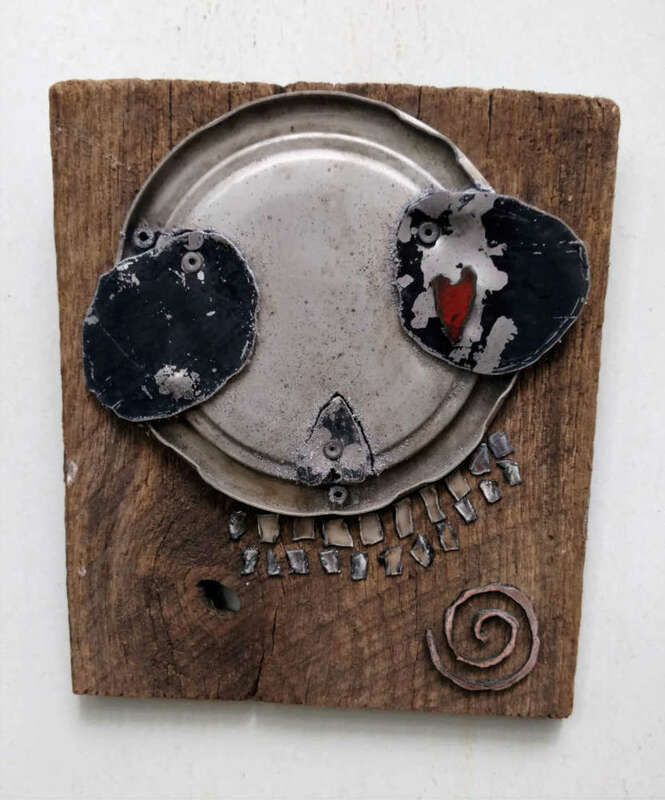 Found object piece made of metal scraps and wood. Measures approx. 12" x 14" x 1"
Skeleton design hand-cut into a hand saw with a plasma cutter. Two skeleton mermaids design hand cut into a steel panel. Measures approx. 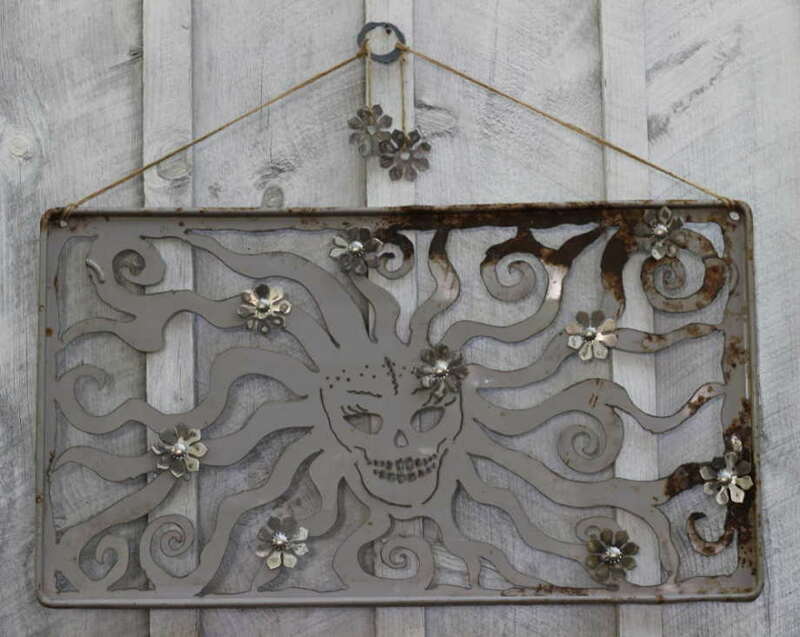 24" x 80"
Sugar skull design hand-cut into a enameled, rusty tray with a plasma cutter. Aluminum flowers added. Approx. 30" x 20". 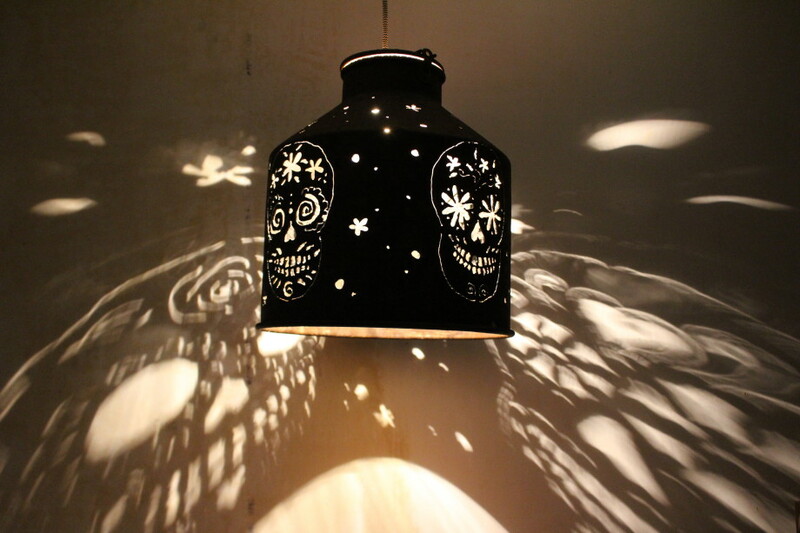 Sugar skull design hand-cut into a galvanized bucket and converted into a hanging lamp. 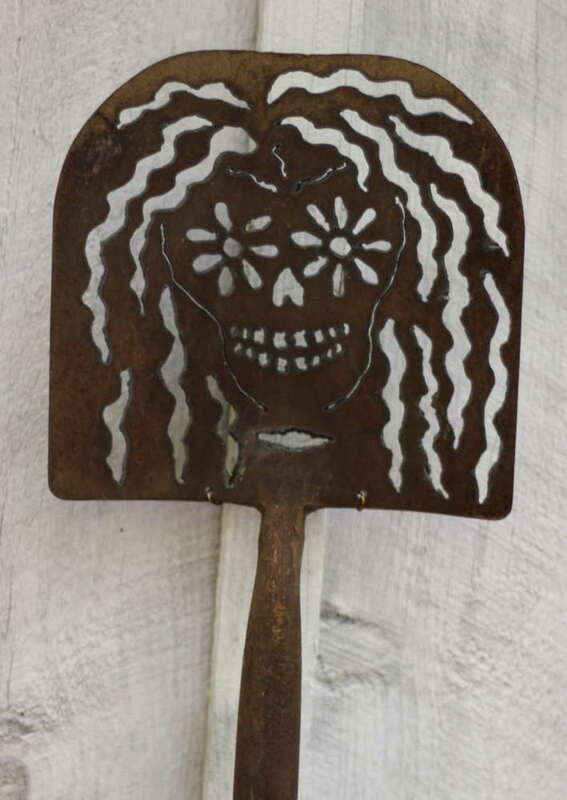 Sugar skull design hand-cut into a shovel. Skelly mermaid design hand-cut into a silver-colored cookie sheet (aluminum), 18" x 24". 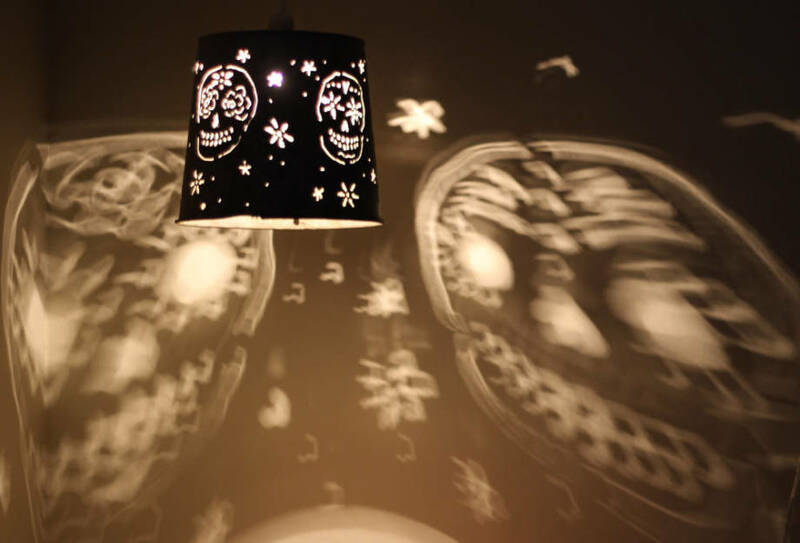 Sugar skulls design hand cut into a galvanized pail and converted into a lamp. Here on display in it's new home. Skeleton fish design hand-cut into a shovel with a plasma cutter. Skelly mermaid design hand-cut into a thin metal sign. Approx. 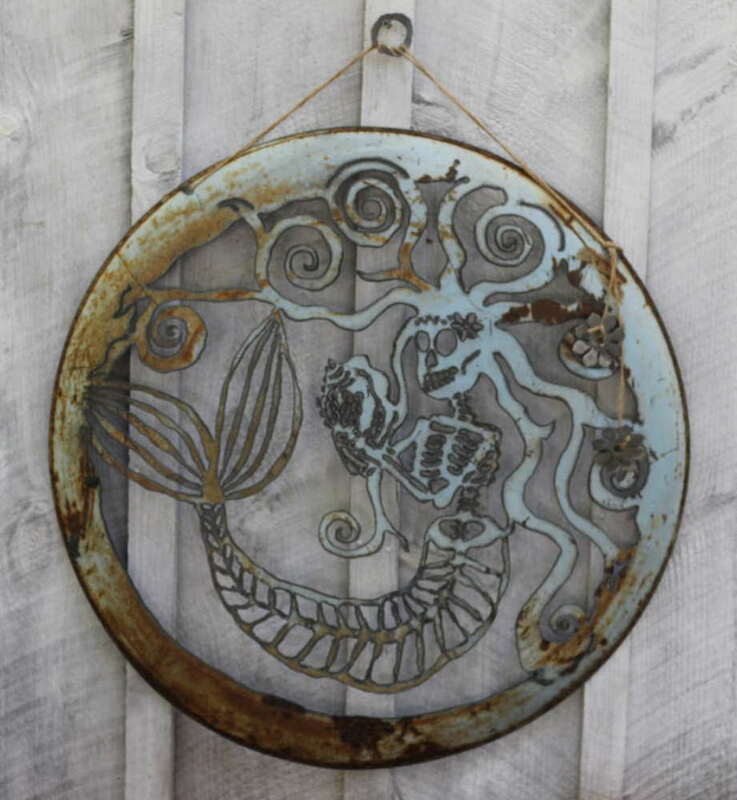 24" x 36"
Skeleton mermaid design hand-cut into an old metal disc sled. 30" diameter. 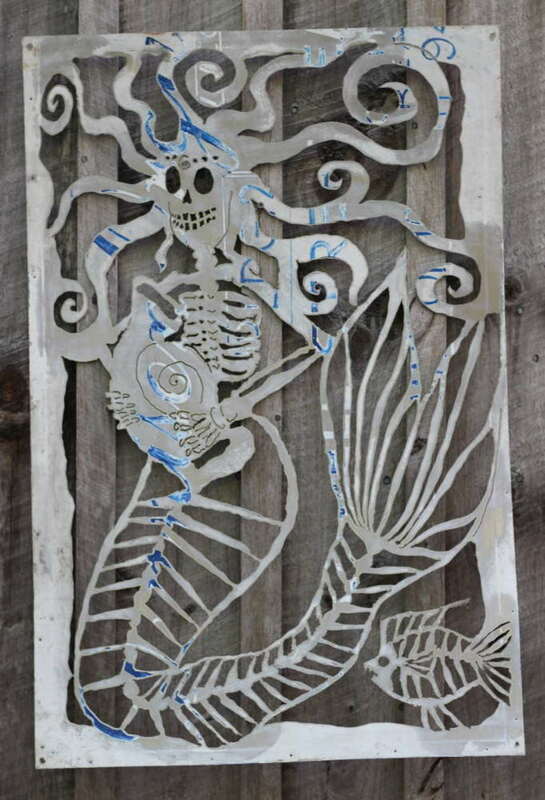 Skelly mermaid design hand-cut into a piece of galvanized steel. Approx. 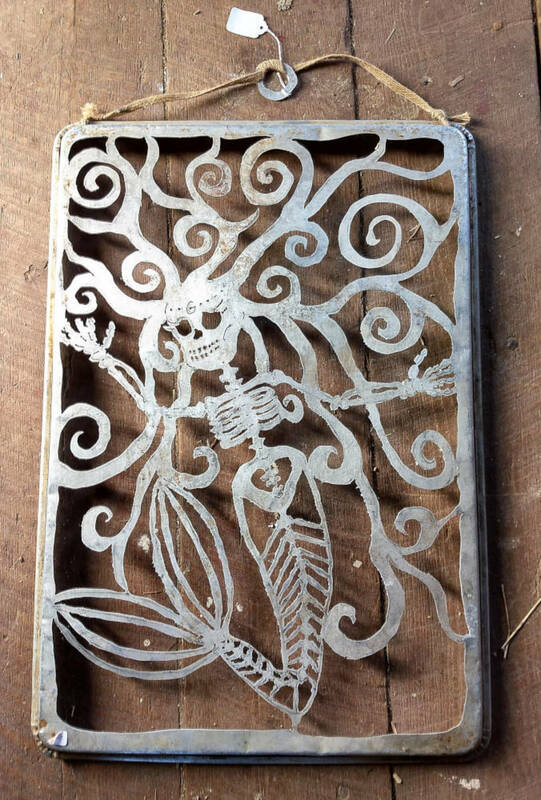 18" x 40"
Skelly mermaid design hand-cut into a drawer cover from an old stove. Approx. 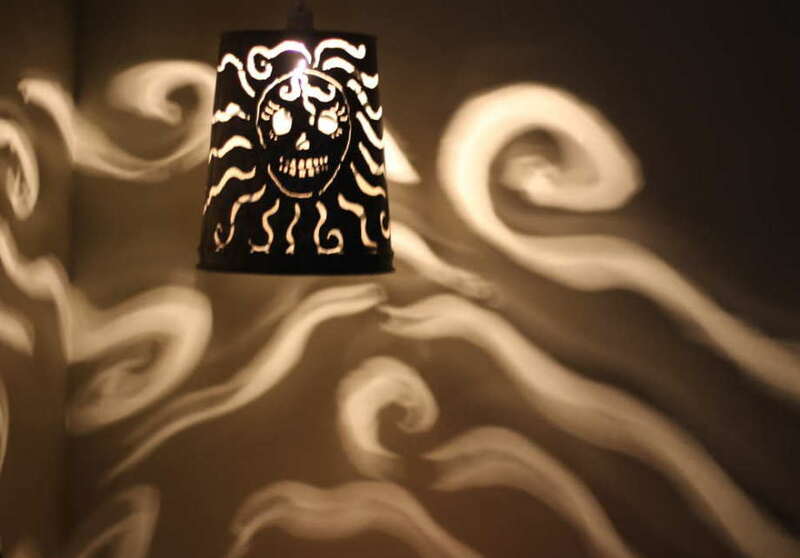 36" x 18"
Design hand-cut into a galvanized maple-syrup pail and converted into a lamp shade. Comes with a white, 15-foot lamp cord with a switch. 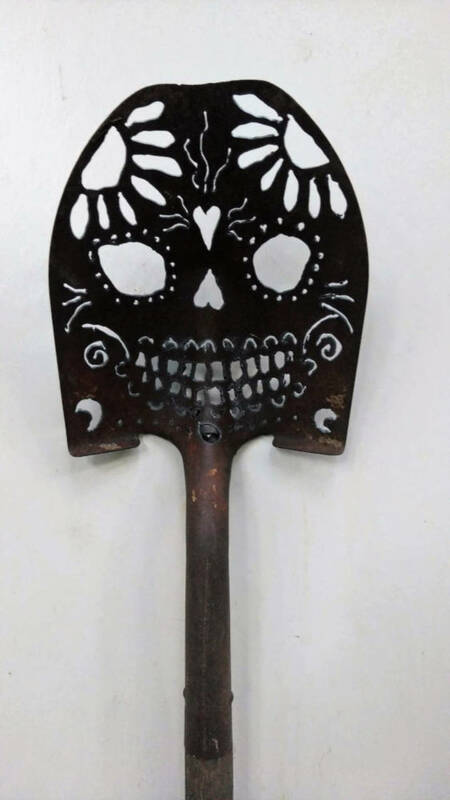 Sugar skull design hand-cut into a shovel with a plasma cutter. Design hand-cut into a saw with a plasma cutter. 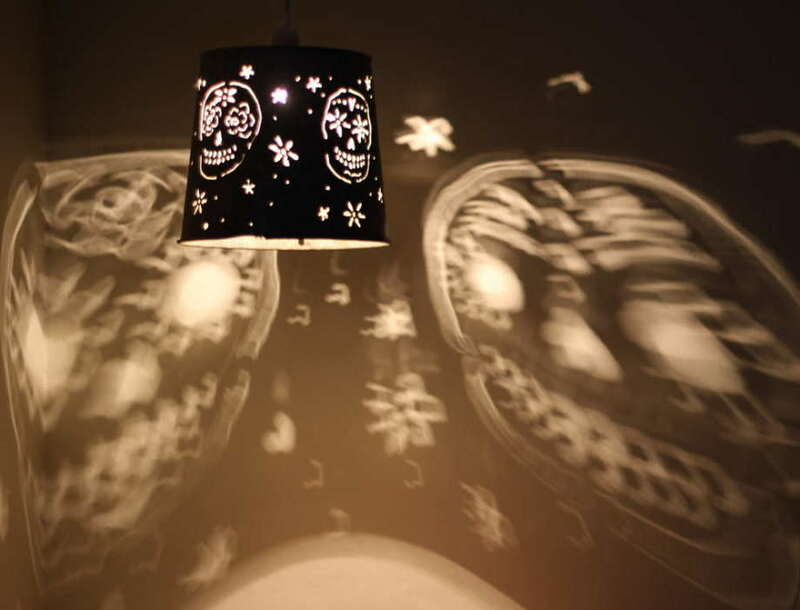 Sugar skulls design hand-cut into galvanized pail and converted into a lampshade. Includes a 15' white lamp cord with switch. 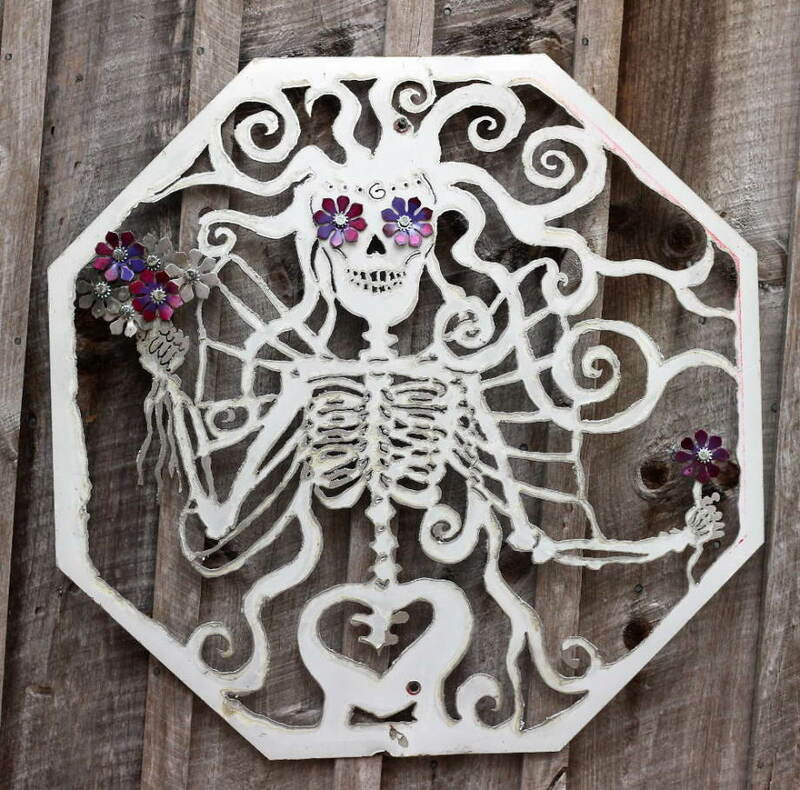 Skelly fairy design hand-cut into a retired stop sign. Approx. 32" x 32". 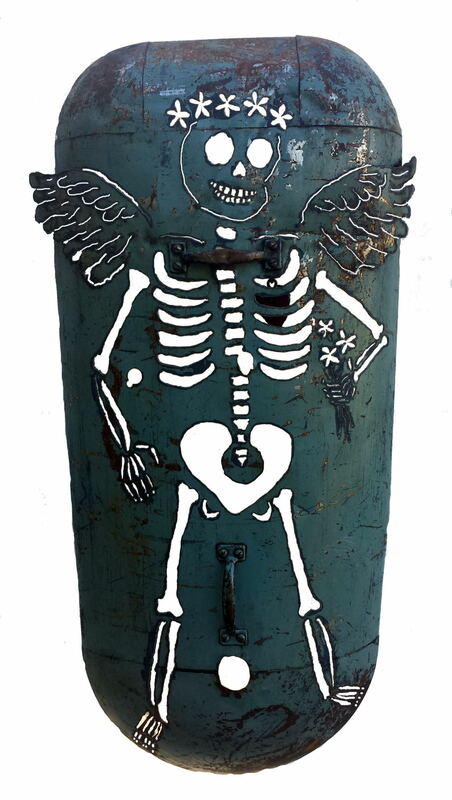 Skeleton and birds design hand-cut into an antique saw with a plasma cutter. I always love making sugar skulls as fall and Day of the Dead approaches. I've also been inspired by the mermaid art I see all around the coastline of Massachusetts (and beyond...)...so I wanted to combine the two! This piece is sold, but I plan on doing many more versions, she was so much fun to work on. She was approximately 84" x 26". 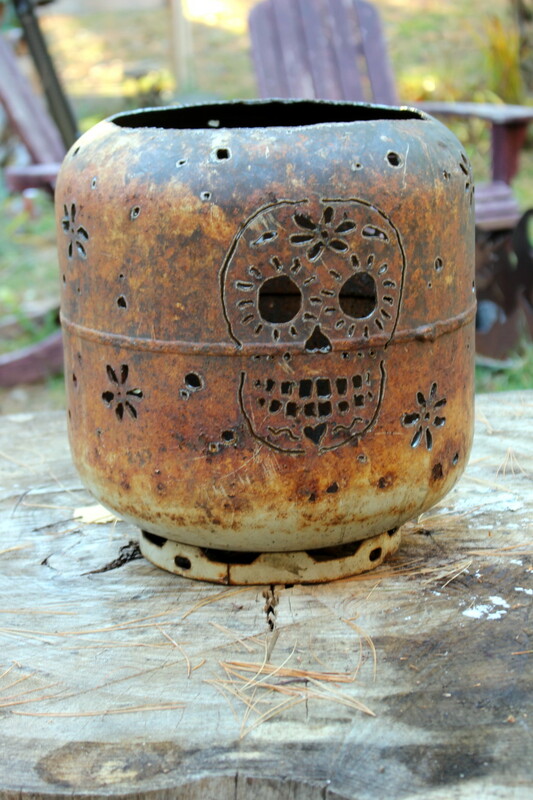 Three sugar skulls hand-cut into a cleaned propane tank with a plasma cutter. Cut out of an old tractor hood. Red metal heart swinging on a small chain welded inside her ribs. Measures approximately 30 x 52 inches. 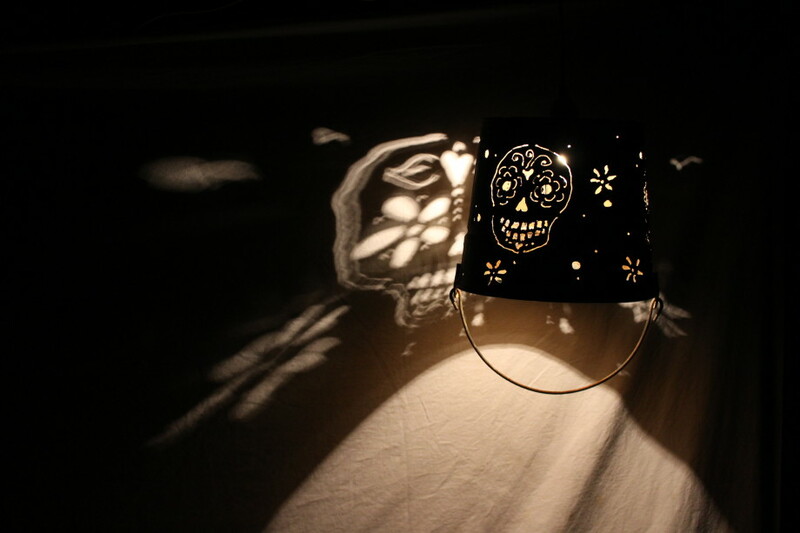 Sugar skull design hand-cut with a plasma cutter in a galvanized steel bucket. Measures approximately 14 inches long and 14 inches diameter. 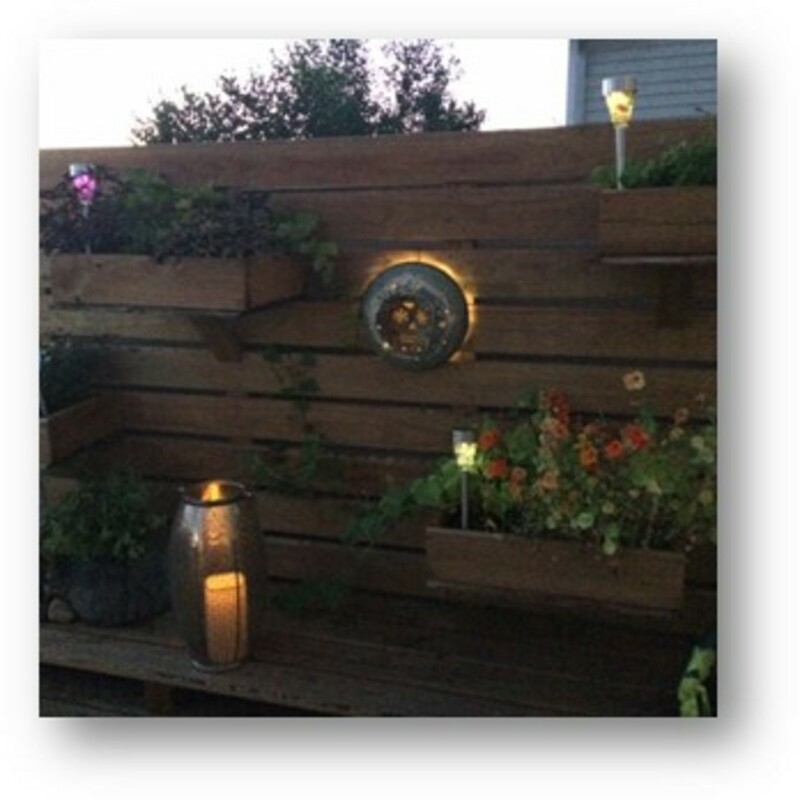 Includes a white hanging lamp light socket with 15' cord. Skeleton holding a crow, with branches and two other crows design. Hand-cut with a plasma cutter in a galvanized steel bucket. Measures approximately 20 inches high and 20 inches diameter. 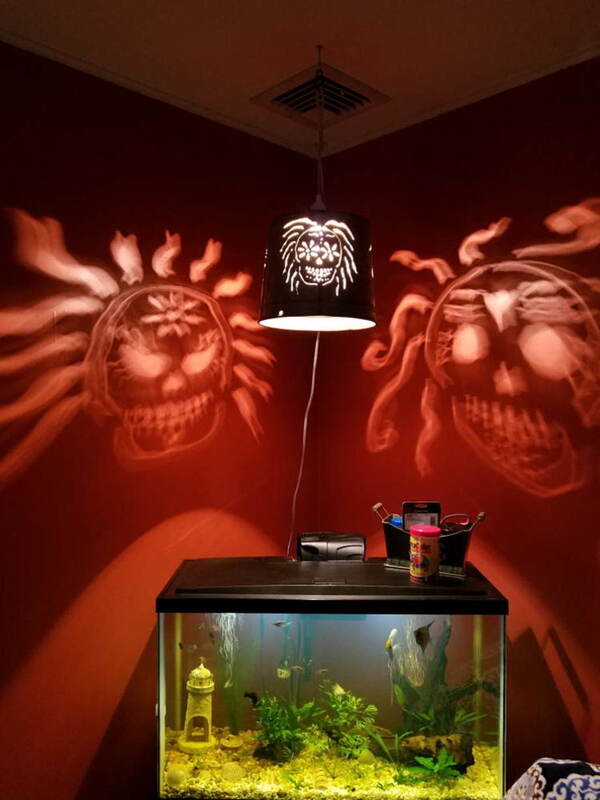 Day of the Dead luminary with solar lights displayed in it's new home! 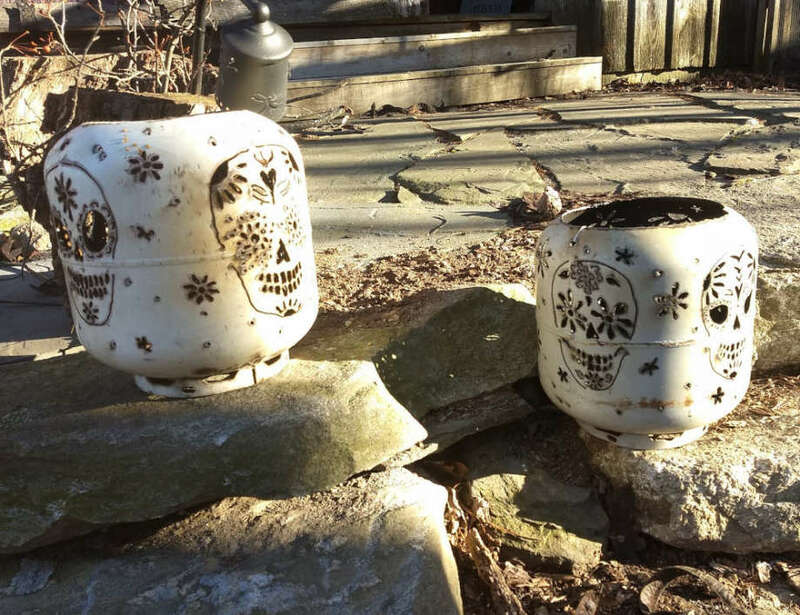 Three sugar skulls hand-cut into a rusty steel large funnel. Measures approximately18 inches diameter at bottom rim.